During our recent trip to MACNA 2013, we spent a great deal of time at the Aqua Medic booth combing over their latest and greatest products. Despite several new additions to their line this past year, it wasn’t necessarily their hardware that the sales reps were so chatty about. Instead, they spoke at great length about their newest project, the Aqua Medic Live wholesale livestock facility. Always intrigued by new things, we took note of every detail thrown our way, especially since the Aqua Medic guys were just so excited about it. After seeing just what this new high end operation has to offer, we can certainly share in their enthusiasm. So, come join us for a virtual tour of this neat facility and read all about the details below. Located in Loveland, Colorado, Aqua Medic Live officially opened on August 17th of this year and its conception was driven purely by a fish store demand of a wholesale distributor in the mid-west. 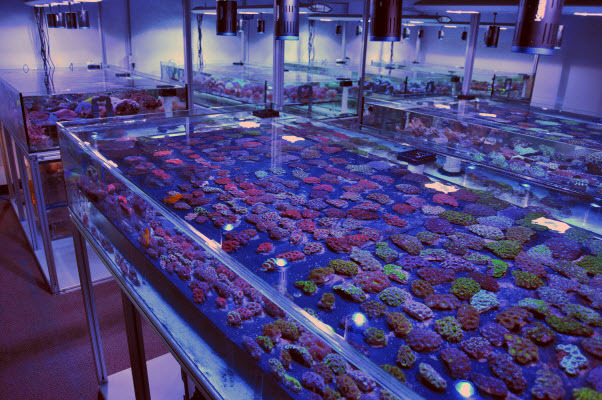 Aqua Medic Live currently only services local stores and companies willing to pick up their corals, though they plan to start shipping orders within the next couple of months pending logistical planning. The operation is small, but rapidly expanding as demand increases. 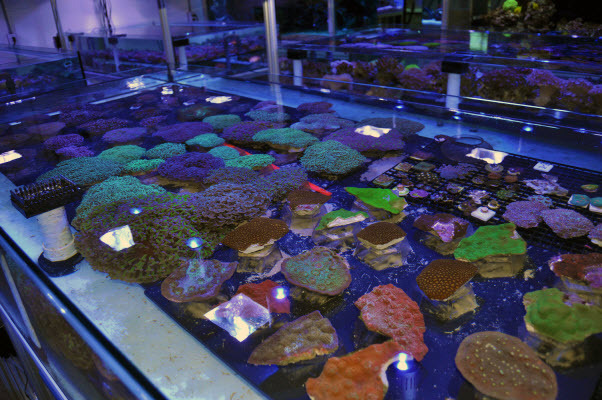 Currently, the facility houses six coral tables measuring 6’x3′, alongside three 220-gallon show tanks that corals can also be purchased from. 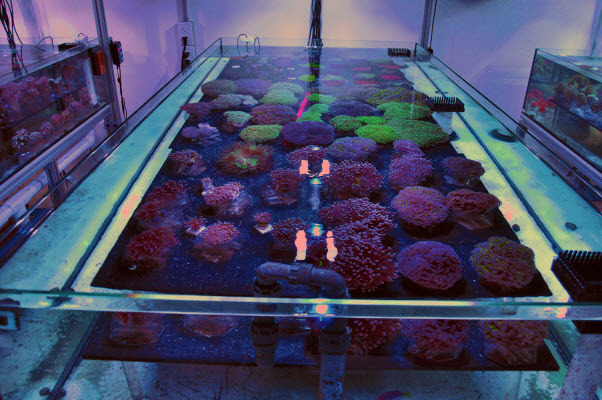 All of the coral tables were built in-house and they are all loaded to the brim with Aqua Medict equipment. 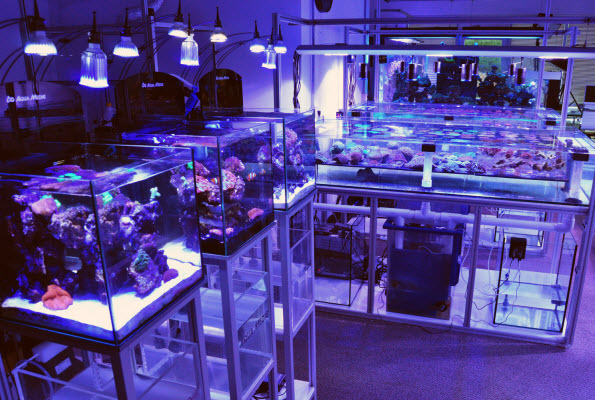 The Aqua Medic light fixtures are supplemented with Kessil A150w in the Deep Ocean Blue variety. 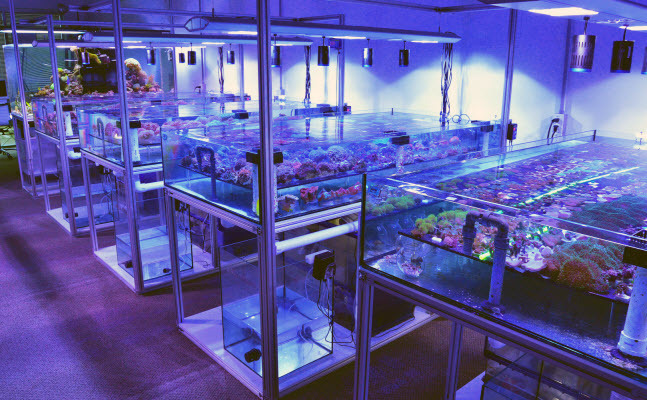 Besides offering transparency, Aqua Medic Live wanted to further set themsevles apart by staying away from the mass production and focuse entirely on high end corals. If you take a look at their website, or the pictues shown here, that goal has clearly been achieved. 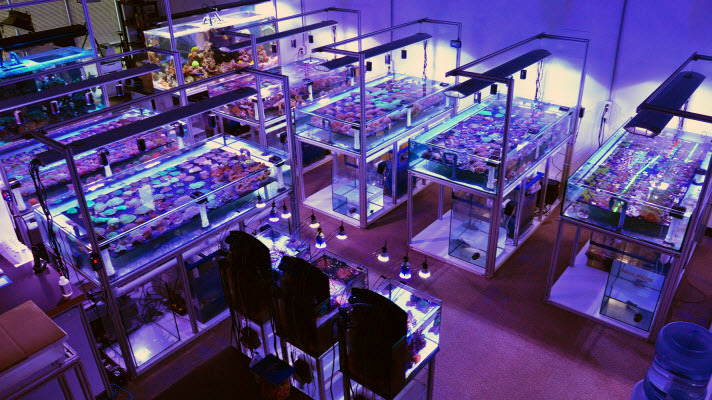 Their boutique-style showroom isn’t a dark, musty looking fish wholesaler. Instead, it’s very clean and inviting. The livestock is sourced primiarly from west Australian, but AML does import from Indonesia, Fiji, and Florida. 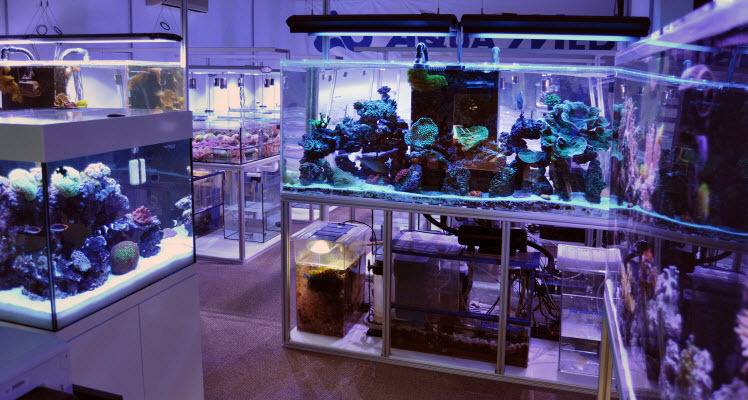 Besides high end corals, the wholesale operation will also carry various invertebrates, though they currently only offer clean-up crew types. Ornamental inverts and fish will be offered as well. Livestock isn’t the only thing that AML will be selling. 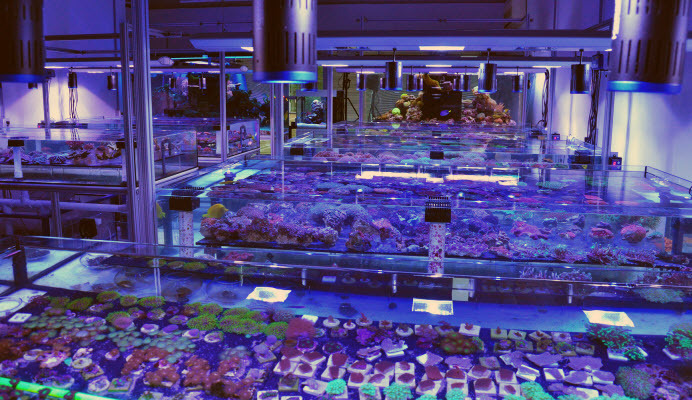 According to the sales reps we spoke to, they will also help stores develop thriving operations by offering to set up coral tables and offer advice for livestock care. The idea is to help the stores extend that high end, boutique look to the end consumer. Aqua Medic Live obviously does this in hopes that the stores will be successful, and send more business their way. AML has a brand new website at www.AquaMedicLive.com and they can also be found on Facebook. Customers can reach the AML team at sales@aquamediclive.com to register for an account. Big thanks to Chad Wohlers and the rest of the Aqua Medic team for including us in their great journey through this hobby. 🙁 There website got hacked. Both their main site and there water testing site. Hi Richard, the stands are made of anodized aluminum, bold together with vibration resistant connectors. Send us an email to sales@aqua-medic.com for more details.